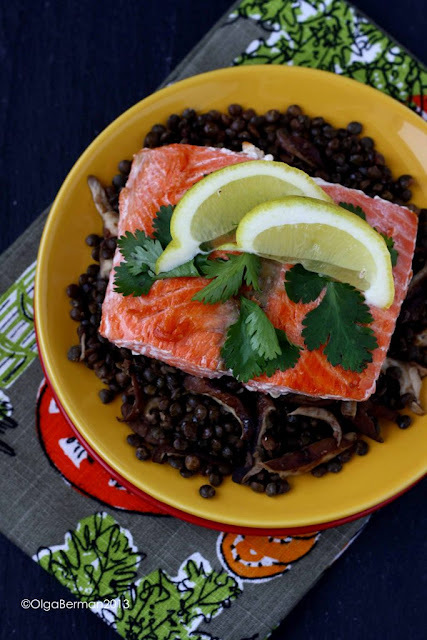 This Lemony French Lentils with Shitake Mushrooms & Pan Seared Salmon recipe is inspired by a dish I had at Pappo while visiting friends in Alameda, CA. I guess this is more of a how to put different things together post than a true recipe, but I have faith in your cooking abilities! 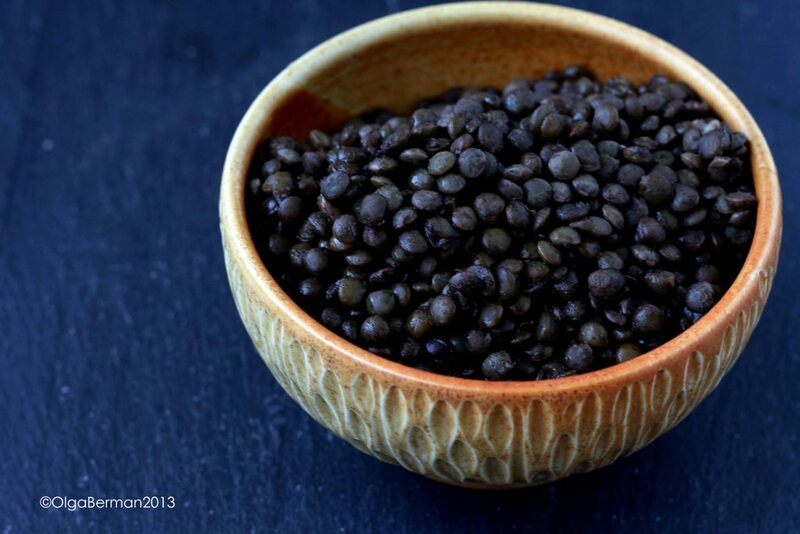 The French lentils are not only beautiful, but they retain their shape after being cooked unlike other lentils. Of course you know that salmon is good for you, and so is garlic. 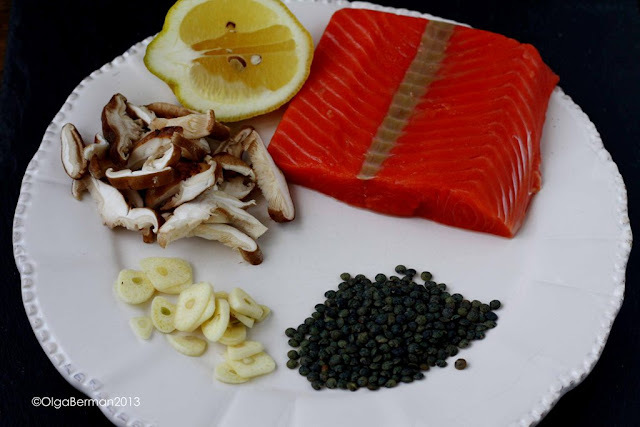 With a bit of earthy flavor from the shitake mushrooms and some brightness from the lemon, this dish really has a lot to offer. 1. In a skillet, heat the olive oil. Add mushrooms and garlic and season with salt and pepper. Saute until the mushrooms are slightly crispy. 2. Add cooked French lentils and lemon juice to taste. 3. Meanwhile, pan sear salmon on both sides in olive oil and season with salt and pepper. 4. 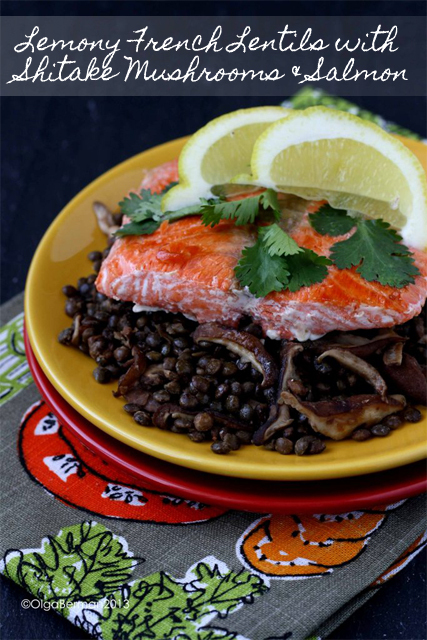 Serve the salmon on a bed of mushrooms and French lentils and garnish with fresh cilantro leaves and a bit more of lemon juice. Have you tried to recreate a dish you liked in a restaurant in your own kitchen? Were you successful? The finished dish looks stunning! 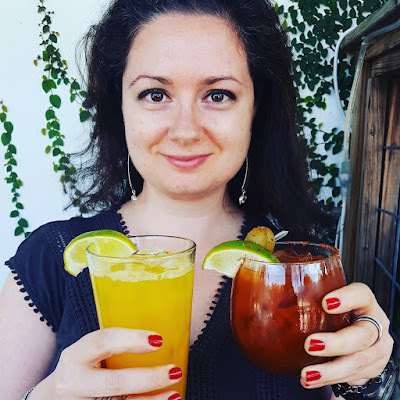 I had it both ways: hot as soon as it cooked and then room temperature the next day.